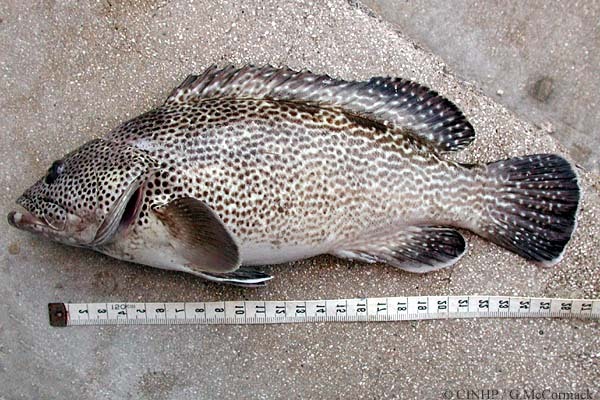 KEY FEATURES: A dark grouper, adults 30-45cm. Thickset (depth 3x in SL), with round tail. Body cream with brown-black spots NOT forming distinct hexagons; posteriorly spots joining foring wavy longitudinal lines; throat and belly without spots; dorsally 4 dark blotches, with 5th on tail-base; fins and tail darkening distally with white spots, subterminal black band and white margin. SIMILAR SPECIES: The dark spots on the pale body giving away to white spots on the outer darkened fins and tail, and the pale unspotted belly are definitive. Cooks: Heemstra & Randall 1993, FAO Fish. Synops. #125, Vol.16. Rarotonga: field ID Sims (Sims88); BPBM1984. Mitiaro: fieldspecimen+photo, fisherman, 5/2001, ID GMcC - a thorough ID. Palmerston: reported (Preston95); NMNZ14651. Manuae: specimen night reef-gleaning, photo & ID Sims confirmed Randall (Sim88). Tongareva: ANSP77451. Manihiki: 1 specimen #A958 (B&M74). Pukapuka: informant reports at NBSAP meeting, 2/2004.